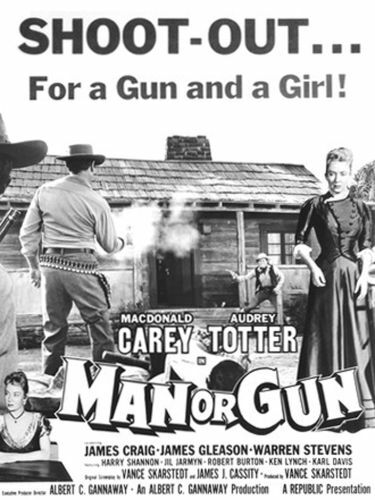 Produced at Republic Studios during that western-film factory's twilight years, Man or Gun stars MacDonald Carey as a drifter named Maybe Smith. Before he gets a chance to say "Like sands through the hourglass...", Smith gets mixed up in the lives of several timorous townsfolk, who suffer the despotic excesses of a powerful ranching family. James Craig plays Pinch Corley, the meanest member of the clan (Admit it now: you've never seen any other movie with characters named Maybe and Pinch) The title derives from Maybe's quandary over whether to take on the Corleys with his fists or with his gun. Man or Gun takes its sweet time (79 minutes' worth) allowing Maybe Smith to work out his problem.